Our crew is finishing our first camping trip in Redwood Falls. During this trip we worked for the Department of Natural Resources (DNR) Fisheries Department on Aquatic Management Areas (AMAs). We got to break out the backpack sprayers and spray thistles that were invading some reclaimed prairie lands. The method to take out this invasive species was to line up with our backpack sprayers and do grid patterns through the prairie, pivoting at the end of each transect, and repeating back down to the other end. This could get repetitive after awhile, but we made sure to have music playing so we could dance and spray at the same time to keep ourselves entertained. We also had a few good scares from snakes and pheasants jumping out at us! To keep things interesting, we even got to meet a baby fawn that was taking a nap nearby—which made my day. On the days it was too rainy to spray chemical, we removed parsnip instead, and found out that the Corps boots can also double as swimming pools for your feet. These rainy days made our first camping trip a very soggy one to begin with but by midweek, it stopped raining long enough for us to hammock, cook s’mores, and start to feel a little bit less like soggy noodles and a little bit more like happy campers. Posted in Field Crew Blog. June 20, 2018 by Megan Zeiher. First off, I would like to forewarn you that I am getting a little overly sentimental about my Conservation Corps term winding down. With that being said, I think the sentimentality is warranted, and I would like to tell you why. I thought about it a lot over the next seven months, and she was right, at the time I really did not see it. I was skeptical. 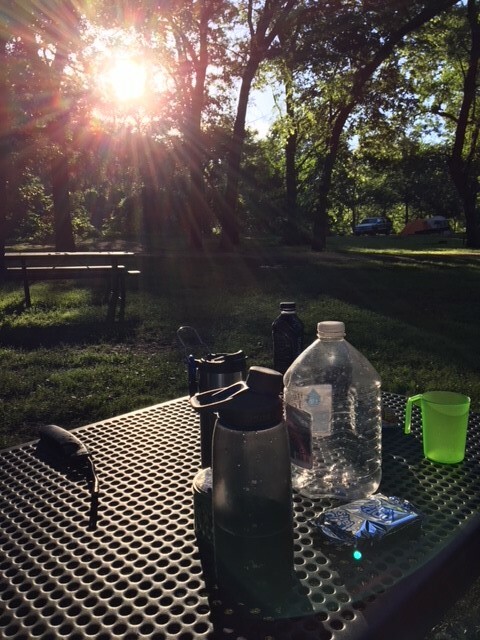 It was getting to be summer, we were treating invasives, planting endless amounts of trees, and I swore we were never going to leave the Munger trail. I was tired. But, as the months passed, she proved to be right in more ways than one. Through the hot summer days of invasives, trail maintenance, and back country trips, to the cool days of chainsaws and construction projects, the Conservation Corps has proven to be more than a job, more than “something to do for a year.” It has been a challenge, a perception change, an opportunity to get to know myself more than ever before. I have never truly had to test my physical ability or my technical skills, and have rarely been pushed out of my comfort zone. 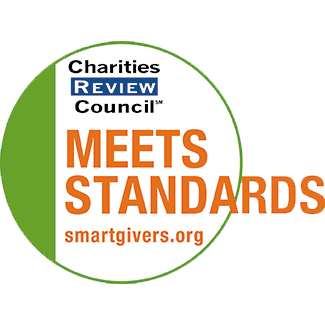 This past year challenged that, my program staff challenged that, and my crew challenged that. Jenna challenged my fear of trying something new when faced with the possibility of inadequacy. Katie challenged me to keep trying when I felt weak (you should have seen me the first time I picked up an ax). John challenged my occasionally linear thinking mindset, and Ben challenged the need to always be right (sometimes, at the beginning, I swore my chainsaw was broken, I really just needed practice). And that was just our field staff; I cannot even begin to describe how thankful I am for my crew. They pushed me to try new things, they made me laugh, often until I cried. Many days they were my cheerleaders (in a really masculine, cool way), my teachers, and my honest, sassy critics. I gained so much from my term of service—more than I could have imagined. So thank you Jenna, Ben, Katie, John, Jerry, and Chris—thank you for teaching us both technical and soft skills, for guiding us, and encouraging us. Thank you to the entire Northeast District, particularly Arrowhead, for being quirky, unique, talented, and for letting me hang with you. Most of all, thank you Amber, Nick, Josh, and Jack for being unapologetically yourselves; adventurous, crazy, hilarious, skilled, and most of all, an extension of my family. 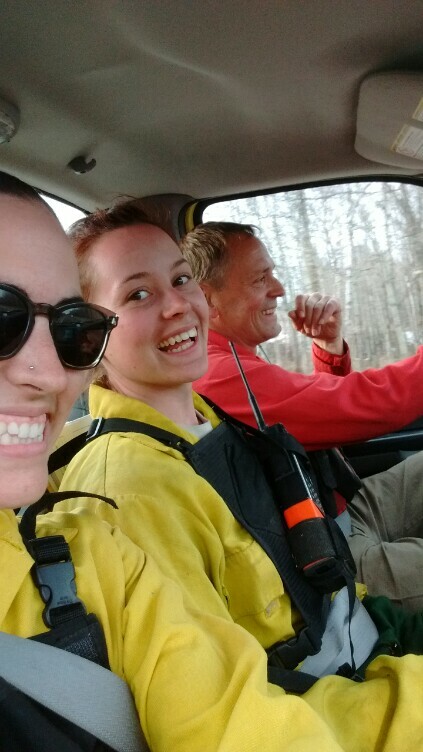 Now that my sentimentality is over, I invite you to take a look at what a year in the life of a corpsmember looks like, through the eyes of the Moose Lake crew. Posted in Field Crew Blog, Blog. November 2, 2016 by Bailey Erickson. As the amount of months remaining in our term continue to wind down, my time spent reminiscing over the year has already increased. What I’ve began to realize is that the detours, the projects or events that weren’t originally a part of the plan, were some of the most memorable. Three detours in particular stick out the most, and they involved fire, some flooding, and a little bit of frost. 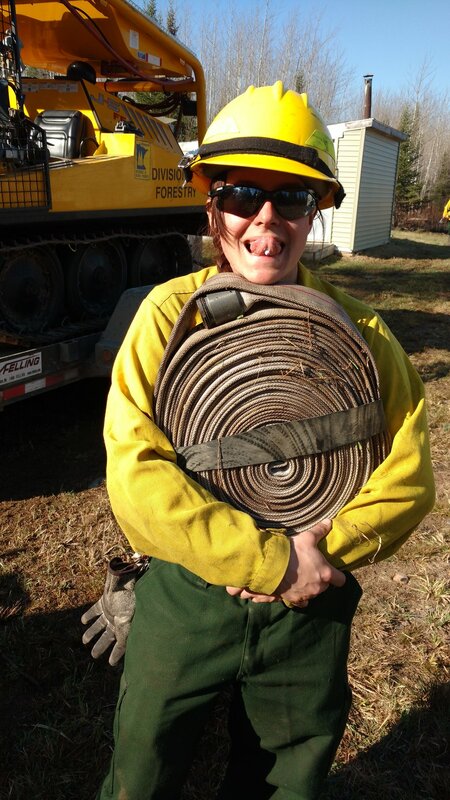 During this past spring I wrote about our time working as a prescribed burn crew, but the morning I submitted that post was the first day of our Minnesota Interagency Fire Center or MIFC deployment. We left our project on Wednesday and on Thursday we found ourselves in Nimrod, MN on the Lyons Fire. We spent a few long days at the Lyons Fire, we arrived when there was still flames and the highest ranking incident command team in the state was present and when we left we were the last crew assigned to the cold fire. We met new people, and crossed paths with DNR staff we had met before. We even celebrated a crew member’s birthday. From Nimrod we were resource ordered to the Cloquet region, where we stayed until it rained. Our MIFC fire deployment was one of the road marks of the year. During fire season we spent 28 of 30 days together, and it solidified us as a crew. After the fire season, came the wet and stormy season that wreaked havoc in the Northland. It began to rain one afternoon while we were working in our shop, within minutes we were running to our vehicles trying to get home before flooding stopped us. The next morning required alternative routes to navigate the flood, the boys on our crew found themselves stranded from a washed out driveway. The DNR staff divided to assess damage, and once our crew had all arrived, we were asked to check on a forestry road. Through various unfortunate circumstances, we found ourselves rerouting around flooding for hours, turning an hour drive into a four-hour drive. Amidst the stress, we found ourselves problem solving, and choosing to be positive together. Posted in Blog, Field Crew Blog. October 13, 2016 by Bailey Erickson. Headed back into Arkansas one last time for the year we make our way into Arkansas Post, five and a half hours into the southeast corner of the state. While visiting the park in Gillett, Arkansas, we were on the constant hunt for Alligators while driving into and walking around the park. Our trip to Post consisted of backpack spraying two hundred and twenty acres while searching for privet and hardy orange. 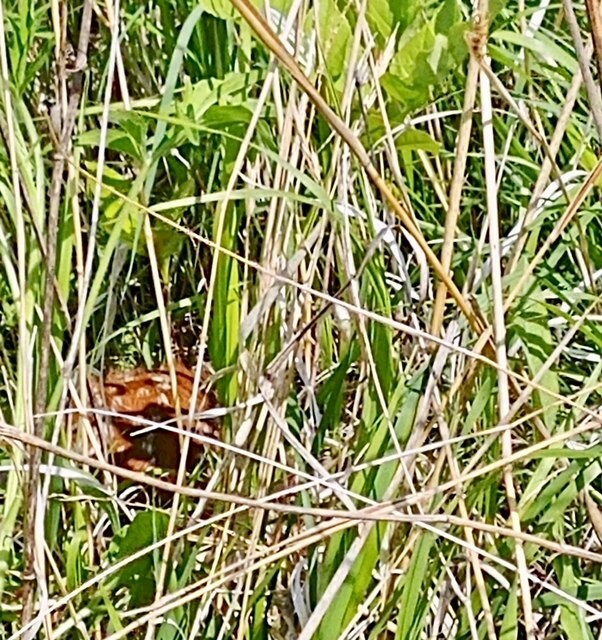 An interesting thing that we literally ran into were the amount of ticks in this park. While walking through just one pass we would collect about one hundred sea ticks crawling over our boots and making their way up our pants. All six of us have never seen so many sea ticks in one place until we went to this park. The tick problem was so bad that even the local deer have a problem fighting them off. Kirby McCallie, the park’s national resource manager, told us all a lovely story of how there have been multiple does that have died from the amount of ticks that they have had attached to them. On top of their growing tick problem they also have a problem with their raccoons, they have such a low amount of food to scavenge for that they will kill the turtles. So when the turtles come onto land to lay their eggs the raccoons would get them on their backs and devourer them (as seen in the photo below). Below feel free to learn about one of my other crewmates Gabe Hernandez and his experience thus far at this park and working for the National Park Service. What is your favorite part about working at Arkansas Post? Post was exciting because every morning we would pass large pools of swampy waters searching for alligators. 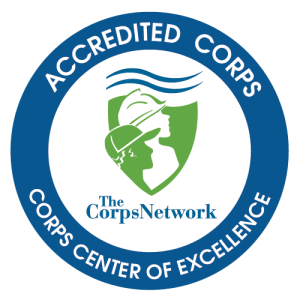 Why did you join the Conservation Corp? I joined to get some field experience under my belt and enjoy the beautiful outdoors. What is your favorite park that you have worked at thus far? And why? Thus far Buffalo National River has been my favorite park to travel to. If you want to experience the Ozark’s beauty, this is the place to be. September 27, 2016 by Bailey Erickson.